Clancy the Keeshond honks his horn to get your attention to keep writing/calling New York State officials to keep the momentum going to rescue the 60+ remaining Keeshonden and other dogs being neglected at Marjorie’s Kennel in Harpursville, NY. 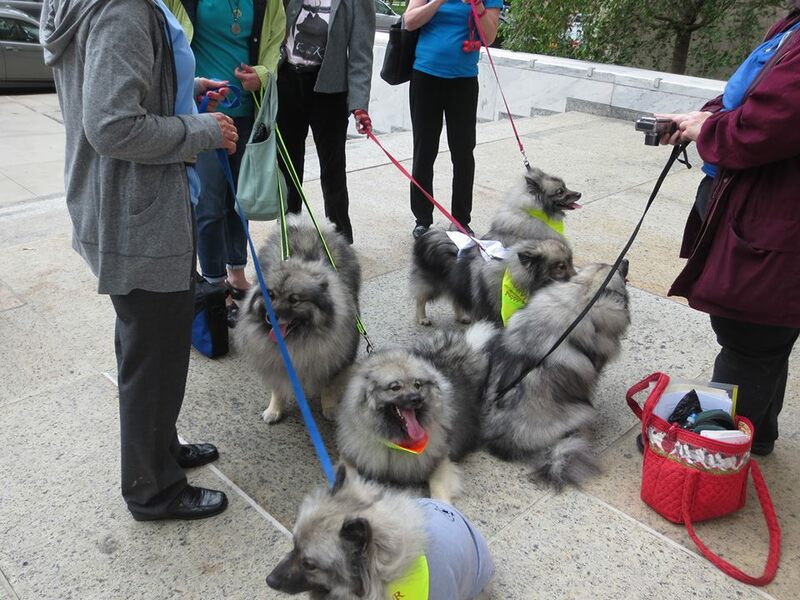 Last Tuesday, a group of dedicated Keeshond lovers and several of the Keeshonden that were lucky to be rescued in 2013 from Marjorie’s puppy mill, traveled to Albany, NY. They delivered nearly a quarter million signatures on the petition to Governor Andrew Cuomo to enforce Charlemagne’s Law and to look for answers into why Marjorie’s Kennel is still allowed to be in operation. See a brief report on the local news here and keep updated on events through the Free The Kees Facebook page. 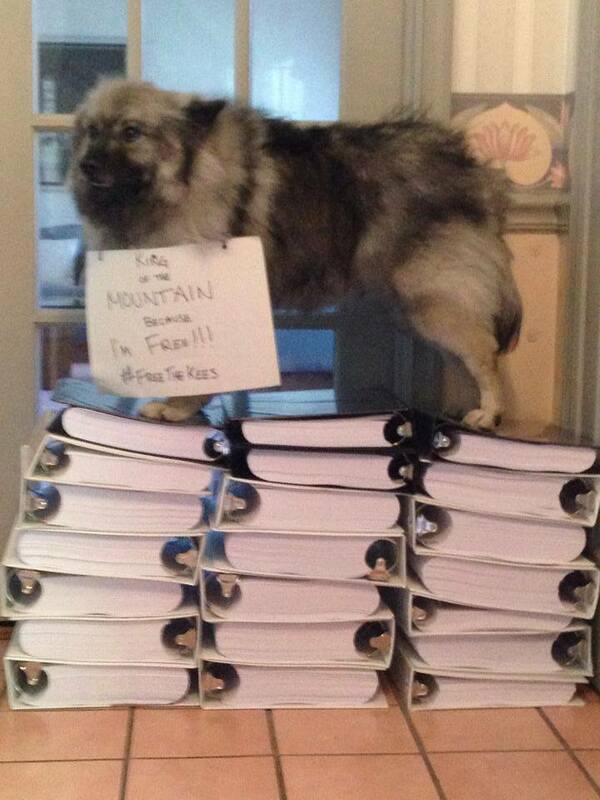 One of the lucky Kees that was rescued from Marjorie’s Kennel in 2013 stands on the mountain of binders that contain 222,000+ signatures and tens of thousands of comments on the Free The Kees petition. We still need people to keep the pressure on to show New York that we are not going away, so please keep sharing the Free The Kees petition and sign it if you haven’t already. 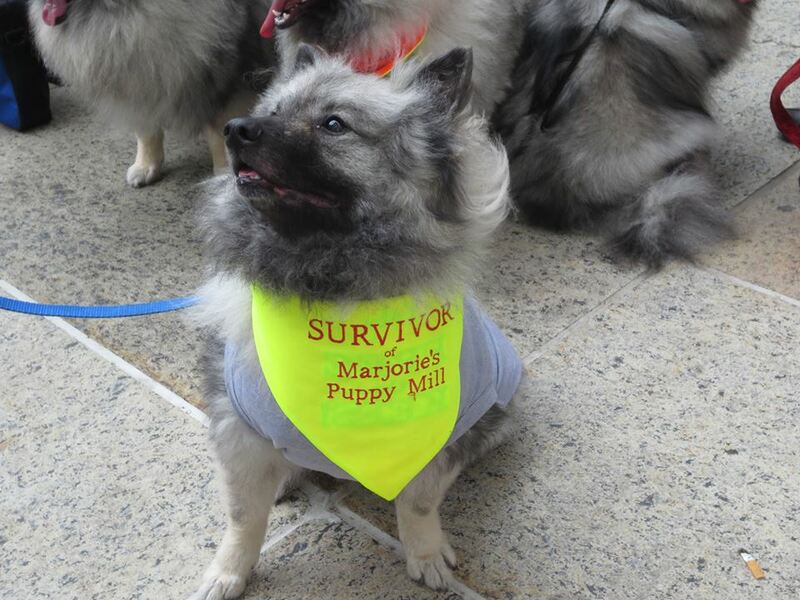 By overcoming the lackluster laws on puppy mills and at least forcing state officials to pay attention to Marjorie’s Kennel, which is on the list of 100 worst puppy mills in the United States again (page 29), it will be a huge step for all dog lovers to make progress in relinquishing the pain and suffering that all dogs in puppy mills are enduring. 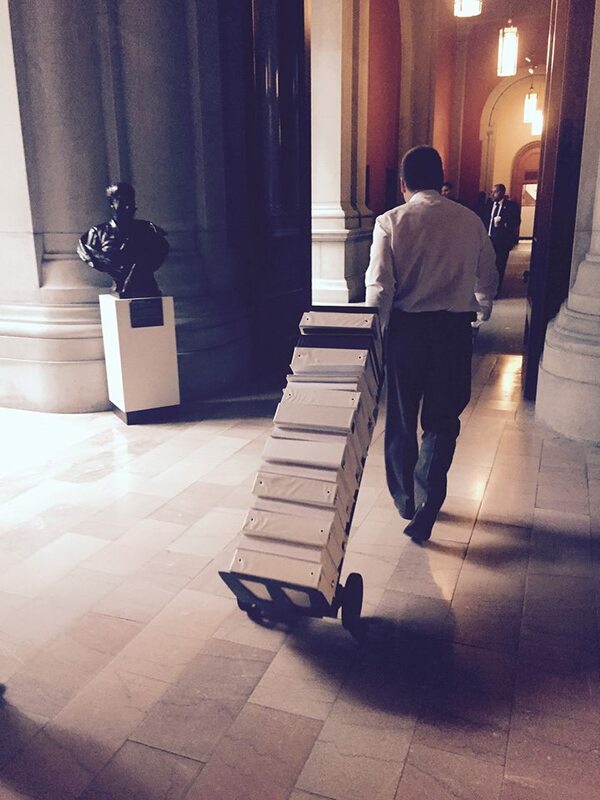 Call Assemblyman Bill McGee, of Ag and Markets Committee. He is preventing the animal cruelty laws from being placed in the NY state penal code section so that law enforcement officers will be required to know what those laws are. Please call 315-361-4125 to ask Assemblyman McGee to allow those laws to be placed into the penal section of the NY laws. UPDATE: It was brought to my attention that there’s an alternate number for Assemblyman McGee… 518-455-4807. Law enforcement officers need training in animal cruelty laws, which they are not currently getting. We feel that fax is the best method because it is the most direct. 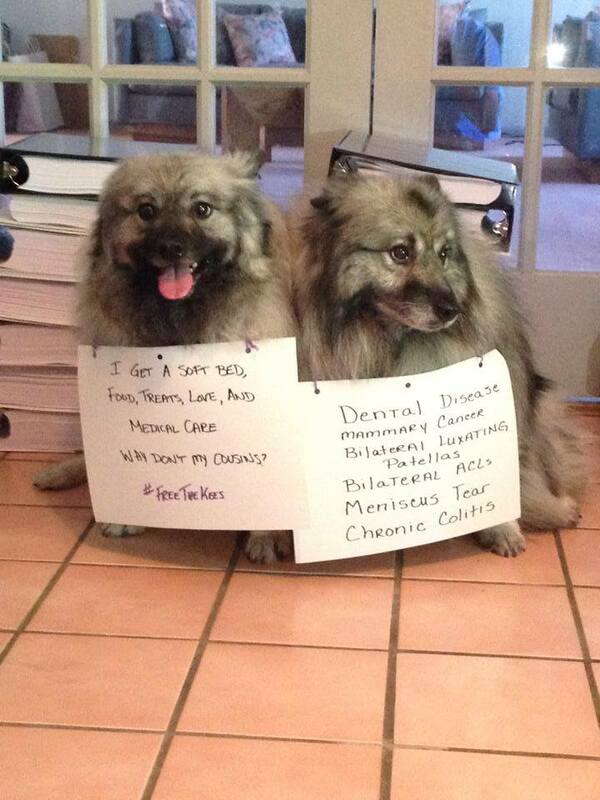 Please enforce Charlemagne’s Law and Free the Keeshonds from Marjorie’s Kennel in New York. Feel free to include any images from the Free The Kees website. 10B AIRLINE DRIVE, ALBANY, NY 12235. On behalf of the 60+ neglected dogs left behind at Marjorie’s Kennel that are continuing being bred for profit, we thank you profusely for any help or attention you bring to the cause. Keep in mind, that Marjorie had close to 200 Keeshonden in her “kennel” originally. She sold many of them, presumably to auction to be part of other puppy mills, put down many of them due to their exceedingly poor condition, and then had promised to turn over the remaining 101 Keeshonden to rescue. 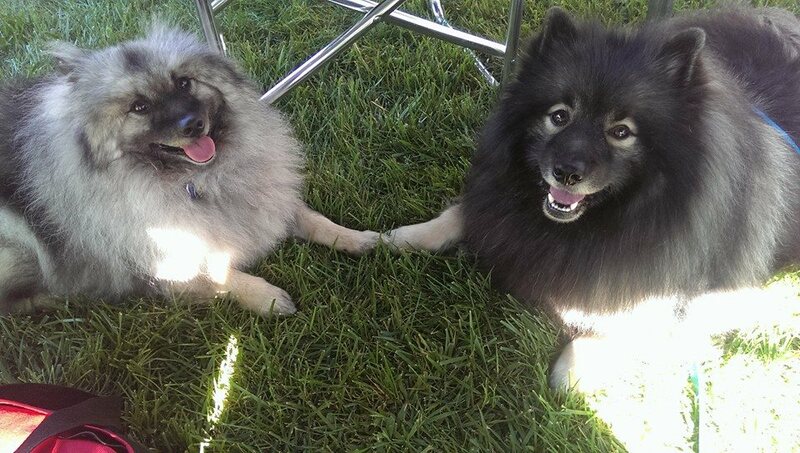 She turned over 50 to Keeshond Rescue in late 2013 and decided to keep the last 51 to continue her business of breeding them for profit. Learn about the story here. This fund is a 501(c) Non Profit. P.S. Hope you enjoyed Clancy’s trick of the day video (honk the horn) to also bring attention to the Keeshond Symposium coming up this Saturday! Categories Clancy ~ My Keeshond, Dog Tricks, Keeshond stuff, Videos starring Clancy the Keeshond!